Entry filed under: Social Media, etc.. Tags: Allan Schoenberg, chat, Christine Perkett, Deirdre Breakenridge, face to face, facebook, facebook status, friends, friendship, ichat, irl, LinkedIn, networking, prcog, skype, social media, social networking, social networking sites, technology, twitter, Valerie Simon. I totally agree. I feel like my SM friends are outweighing my real friends. On a weekly basis I find myself talking about one of my SM friends to my real friends and they’re always like “who?” Although we all chat through SM, it is important and A LOT of fun too to meet IRL as I learned at the Tweetup. Just like in real life, I have SM acquaintances. The people that I know love Gossip Girl as much as I do or are die hard Mets fans. Do I tell them all my secrets? No. But would you tell all of your college/hs/colleagues secrets? Maybe, but I wouldn’t. The relationship is more surface level, for fun. Does that mean there isn’t an opportunity to dig deeper? No there definitely is but sometimes it is what it is. You made a good point about the value of meeting in real life if its possible. I find myself communicating more with my SM peeps than my pre-facebook/twitter dawgs on occasion. There is nothing that can beat F2F interaction and that is why I have been attending as many tweet-ups/networking events meeting new people and current SM buds. I can tweet about sports, food, or whatever, but people can’t a real vibe of who you are as a person unless they meet F2F or in my case face to chest. Just this year I have become more active on twitter and I am amazed how friendly people are. I couldn’t picture five years ago people welcoming to their group of friends with open arms as if I was an old High School buddy. Great post, Mikinzie! My freshman year of college, I met one of my friends on Facebook. Almost five years later, she’s one of my closest friends. SM is a fun and great way to meet new people that have similar interests as you do, but Face-to-face interaction is still important. I agree that some social media friends can definitely become real friends. It depends some on where you live, your mobility, and how many other SM peeps live in the area though. For me, I’ve found that my social media turned real friends have become even more reliable and better friends than some of my “old friends”. I’ve also found that while I may be afraid to meet “strangers” in real life, it’s been a lot more fun, more laid-back, and interesting meeting social media friends because I already know that I have SOMETHING in common with them before we even meet. My recent travels to NYC meeting you, Patrick, Brittany, Elisabeth, Steph Auteri, Teresa, PRCog & others was well worth the trip had I not done anything else. I think that proves that SM friend definitely can be real friends if you want them to be. I’m just now realizing how helpful social media friends can be. If you take the time to actually meet the people whose content you find interesting you will find that they are generally nice and willing to help you with anything. I think those engaged in social interaction online have a better sense of community and they realize that this is a two way street. I would gladly help anybody I follow because they have been such a big help to me! I’ve discussed this many times with many people, but the odd thing for me is that many of the people I trust most are folks I’ve never met in real life. People like Valerie Simon, Heather Whaling, David Mullen, Lauren Fernandez and Rachel Kay. And many, many others. 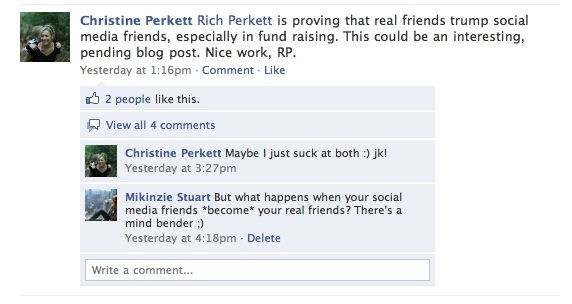 I’ve been fortunate to turn some online friends into “real life” friends, too. Allan Schoenberg, Matt Batt, Sonny Gill, Amy Mengel and David Spinks come to mind immediately. In my mind, I’m not sure it’s an either/or proposition. I guess I don’t really see a difference between my “real life” and “online” friends. For example, I probably talk with people like Heather Whaling more than I talk with many of my college friends. We happen to have similar life situations right now (starting new businesses) so we share a common passion/interest and that has allowed us to get to know each other better. I Skype and IM with Heather regularly. But, like I said, I have yet to meet her in person. But, I’m not sure that matters. Will it change anything when I meet her face-to-face? Maybe. But, I’m willing to bet it’s only going to further solidify an already rock-solid relationship. I’m glad one of my rants could inspire someone 🙂 I understand the value of social media friends, and have met many wonderful people through this means. Like any way that we meet people, it’s an individual preference and style that determines the outcome of the relationship. I know people who have made lifelong friends this way – even spouses! My personal experience is a little different – I already have limited personal time for my spouse, children, family and existing friends, so my social media relationships tend to be more work-related and less personal. But they’re still very valuable in different ways and I’m grateful every day for the new things I get to learn from such a diverse community. And, social media reminds you what a small world it is – as you and I have learned from meeting each other through Twitter! Absolutely, I do. I don’t classify my friends as “social media friends” or “IRL friends. Rather, I refer to all of these people as “close friends” or just “friends” or “acquaintances” or maybe just as “followers” (on Twitter). Social media just gives us another way to interact with these people – some get late night phone calls discussing our most personal moments, some get tweets and FB status messages, some get invited to house parties, some get invited to our wedding – it’s just a another way of communicating with friends, this one just happens to be via computer. I love my SM friends so much, I think it might be time to meet them IRL. Sometimes I’d say that they just seem like more fun in comparison to my IRL friend. MEH. teaching tools that the online learning provider possesses. emails, instant messages, and those are only from the computer. Sing2, you must register as a member. Amazing Web-site, Preserve the great job. Thanks. Do you have any video of that? I’d love to find oout moire details.